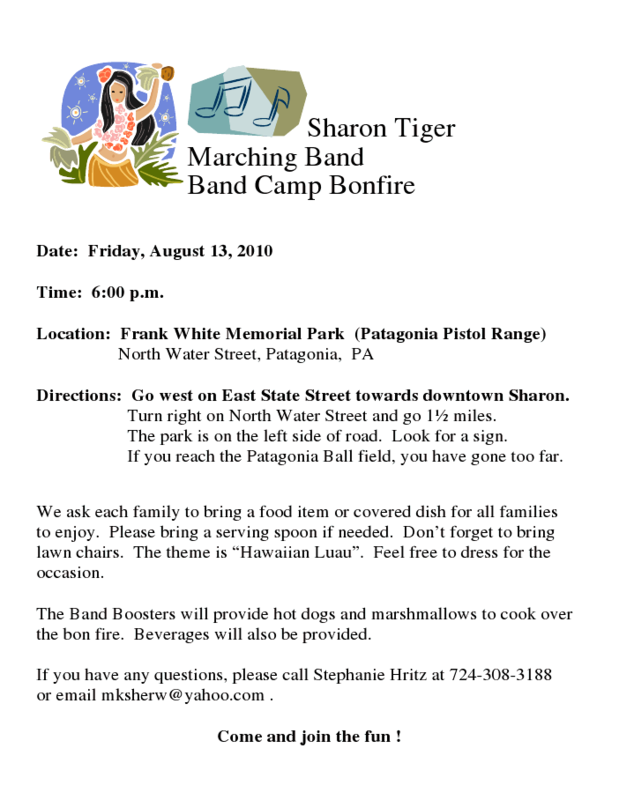 News and information for Sharon Tiger Band members and families. 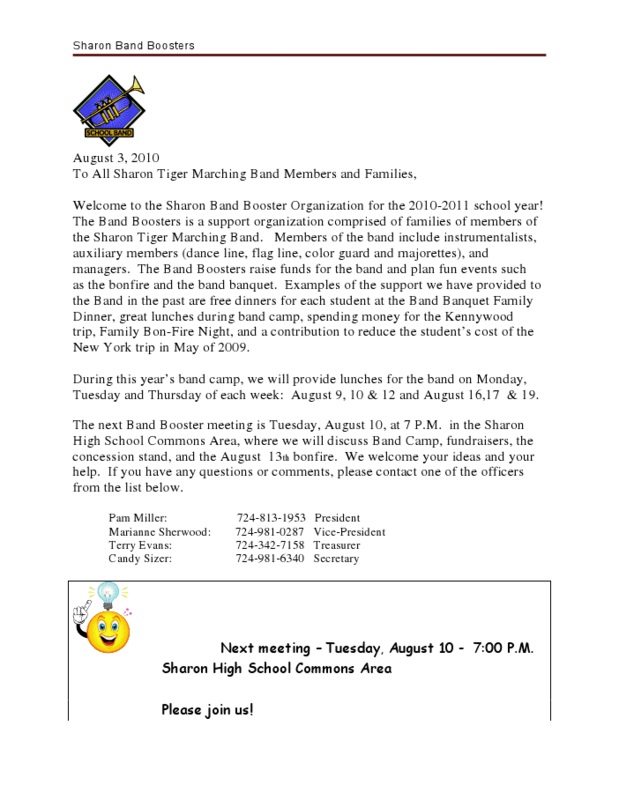 Subscribe to Sharon Tiger Bands News & Notes via email! -OR- Subscribe to Sharon Tiger Bands New and Notes in an RSS Reader! What follows is the text of the 2010 Band Camp Letter that will be mailed out this week. Greetings! It is hard to believe that I am already writing to you about band camp! With the end of the school year, we are making final preparations for this years’ camp. Music has been selected, drill is being written, and music folders are being prepared. Band Camp 2010 will be held Monday – Friday, August 9 – 20, from 8 am to 3 pm. Just a reminder – band camp is not optional. Your attendance is mandatory. If you have any conflicts, please call me immediately at 724.320.9001! In addition to our regular camp this year, I have also scheduled “optional” music rehearsals for the Marching Pride instrumentalists. These sessions are being held every Wednesday in July from 9am – 12noon. Even though these sessions are optional, I strongly recommend your attendance so that we make the best of our time during the regular August band camp. We are once again planning a “Family Band Picnic.” Plans are in the works now, and details will be coming soon! Also, please be sure to visit http://tinyurl.com/mpshirt to vote for your favorite band t-shirt design and color! I would like to get the shirt order in by the end of July so voting will end on July 31st! Please also find the calendar for the entire marching season, which is included with this letter. Take the time to plan ahead now, and to review the attendance policy as outlined in the band handbook. Finally, I would like to take this opportunity to welcome two new members to the band staff! We will have two advisors helping out with the majorette squad this year. First, I would like to welcome back Miss Alison Paoletta, who is a Sharon Alum and former Feature Twirler with the Marching Pride and also a graduate and former Feature Twirler at Clarion University. Assisting her in this position will also be Sharon High’s very own Miss Lauren Myers. We are very pleased to have both of them on the band staff! The entire staff and I are looking forward to a great year. See you in July and August! Our new marching band banner arrived today! Optional Music Rehearsals Begin Wednesday, July 7! Attention all Marching Pride Musicians – Our optional music rehearsals will begin tomorrow, July 7! We will meet from 9am-noon and begin working on the halftime show music for next year. If you are able, please make plans to attend – it is a great way to get a head start on the music so that we can have more productive rehearsals during band camp. Looking forward to seeing you tomorrow morning! Also, please don’t forget to vote for your favorite t-shirt design in the previous post here on the website! Hope you have been having a great summer so far! See you tomorrow! MP Members! Please vote for your favorite T-shirt design! Attention all 2010-2011 MP Members! Please select your favorite T-shirt design below to vote for our T-shirts this year! Please also choose your favorite color in the second poll below! Don’t forget the T-shirts will be either White, Black, Grey or Orange, and the lettering will say something similar to Sharon Tiger Marching Pride 2010-2011. The ink will also be black or orange, depending on the color of shirt! Wednesday, May 12 – Spring Concert – 7pm – The Middle and High School Bands will present the annual Spring Concert at the SHS Auditorium, beginning at 7pm. Dress Rehearsals for Middle and High School students will be held on Tuesday, May 11 at 6 and 6:30pm, respectively. The bands will be playing works by Ticheli, Bach, Holst, Paul Simon, and local composer/teacher, Travis Weller. In addition, the Jazz Ensemble will be playing a full program or swing, funk, and rock/fusion music! Sunday, May 16 – Band Banquet – Billy’s Black and Gold – 4pm – All middle and high school band members and their families are invited to attend the annual band banquet. This includes all marching band and concert band members. We hope you will join us for an afternoon of food, fun, and fellowship. We will also be presenting every student with their band pins, and presenting our annual Director’s Award, Louis Armstrong Jazz Award, John Phillip Sousa Award, Most Valuable Performer, and Most Outstanding Senior. We hope to see you there! May 25-28 – 2010-2011 Auxiliary Clinic/Auditions – All students interested in being a part of the danceline, flagline, or majorettes for next year are invited to attend the clinics after school on Tuesday, Wednesday, and Thursday to learn the audition material for auditions on Friday after school. Monday, May 31 – Memorial Day Parade – 11am – The Sharon Tiger Marching Pride will be performing once again at the Sharon Memorial Day Parade and Ceremony. The parade will begin at 11am at Case Ave. and E. State St. and proceed down State St. to Oakland Ave. and then to Oakwood Cemetery. This is a required performance for all marching band members, and attendance will be taken! Dress will likely be summer uniforms and reporting time will be 10am. Rehearsal for this performance will be held on Thursday, May 27 from 6-6:30pm. We hope to see you at our many upcoming events this month! Have a great spring! New Feature! Sharon Tiger Bands Podcast! We are excited to announce a new feature available to Sharon Tiger Band students – The Sharon Tiger Bands Podcast! This podcast will feature music and practice tips, music history and theory information, and news and updates for Sharon Tiger Band members. 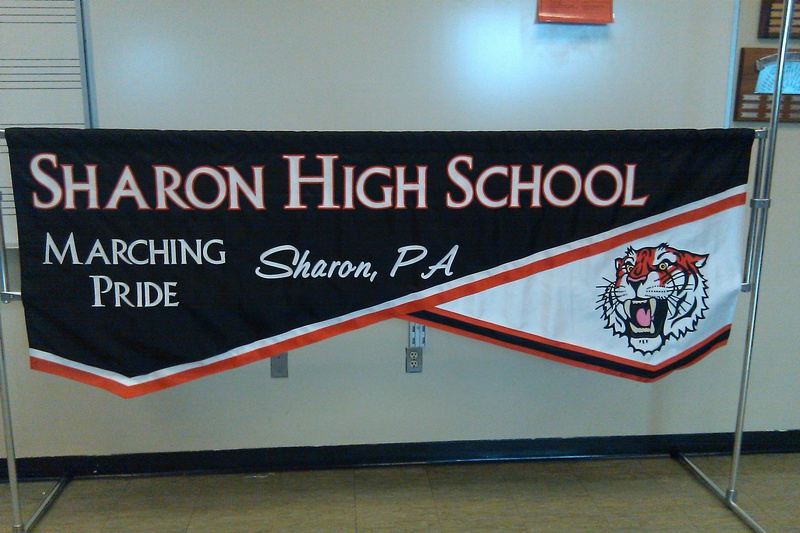 Now, students can have the latest news and information from the Sharon Tiger Bands with them on the go! We hope that you will stop by and either subscribe through our RSS feed or iTunes…just look for the subscription links on the right hand side! You can also find links to the most recent episodes on the right sidebar of this site. Start listening today! Go to http://sharontigerband.podomatic.com! Enjoy! Sharon High School Concert Band Receives “Excellent” Rating! Congratulations to all members of the Senior High Concert Band for an outstanding performance at Tuesday’s Music Performance Assessment at Westminster College! The band garnered two Excellent ratings and one Superior rating (Superior being the highest possible) from the panel of judges for an overall rating of “Excellent.” This is equivalent to a PSSA standard of “Advanced” or a grade of “A.” At the 2009 MPA, the Concert Band performed at a “Grade 2” level, however, this year, the band performed at a higher “Grade 3” level. The performance included a Paul Lavender arrangement of John Williams’ Raiders March, Gustav Holst’s First Suite in Eb for Military Band, and Charles Carter’s Overture for Winds. The bands have been improving by leaps and bounds over the past few years, and this assessment reflects all of the students’ hard work and dedication to the program. Following the performance, Mr. Gary Taylor, Director of Bands at Wilmington High School and Festival Host, commented to the band that “If [he] could give out an award to the most improved group from last year, it would be the Sharon band.” Audio recordings from the performance are here. Congratulations once again to the members of the Senior High Concert Band! On Thursday, March 4, 2010, the Sharon High School Music Department will be presenting a concert celebrating March as Music in Our Schools Month. We hope you will join us in the HS Auditorium at 7pm for a concert featuring the Elementary, Middle & High School Concert Bands and Jazz Ensemble. Also performing on the concert will be the Sharon High School Orchestra and Chamber Strings, and the Tiger Kittens & Men of Note and Concert Choir. We are looking forward to a great concert!